Cor blimey I've just been having a catch up! You are positively SMOKIN' aren't you?? Loving all the cards - did Little Myz give her fiancee his or does she have to wait till back to school? 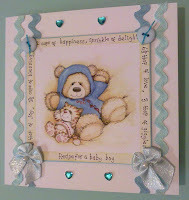 Hi fabby card I love the image its sooo cute. Thank you for joining us at CES Challenges this week hope to see you again. Very pretty and cute card. Thank you for joining Alphabet challenge. Wonderful card. How sweet. Thanks for playing with us at Cards for Men. Good luck on the Challenge. Great card, Gail. Thanks for joining us over at Cards for Men and good luck with the challenge.